As part of the development of The Way We Green Strategic Plan, we’ve had a series of Public Surveys where we’ve asked Edmontonians to give us your ideas about sustainability, the environment and what Edmonton needs to do to ensure we live in harmony with nature. Most recently some of our summer students have been out and about asking Edmontonians what they’re thinking about Edmonton and how we can all work together to preserve and sustain our environment. Our summer students are going to be providing some regular updates from the street. Here’s the first update. Hi, I’m Tristan! As a Research Student for the City of Edmonton, I was fortunate to be at the recent Cariwest Festival with my co-worker Chris, engaging the public about ‘The Way We Green’. A bright, sunny day and the vibrant energy of Cariwest promised lots of people, and it was interesting to get an insight into public opinion. Although there were many people at the festival who passed by us to enjoy the many booths, booming bass, and dazzling colors – there were quite a few who did stop to chat with us. Some people had heard of ‘The Way We Green’ initiative, and knew a little bit about it, while others were being introduced to it for the first time. 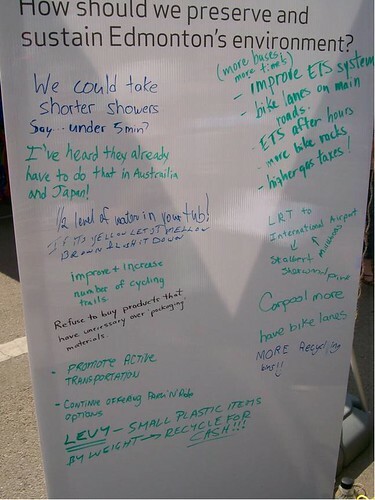 There was also a large diversity of ideas and opinions as to what Edmonton should do to make the city more Green. One person was quite passionate about pesticides, herbicides, and how harmful their short and long-term effects can be to the environment, and more importantly, to human beings. They raised the concern that these products are being used in children’s playgrounds, hospitals, and in parks. A mother from the suburbs advocated strongly for public transit, specifically busses, as she felt that the current transit system is doing an inadequate job of meeting the transportation needs of her school aged children. I must admit, I can relate to wishing that buses came more frequently and had routes running at later times of the day than is currently offered. An enjoyable experience was hearing a woman speak of Edmonton with love, reminiscent of a mother whose child has grown and gone. Although she herself has since left Edmonton, she said hearing about ‘The Way We Green’ evoked a feeling of pride. I was pleased to hear a couple of Edmontonians share with me all the things that they already do to be environmentally friendly – they said that they have two composters, one outside and one inside (Vermicomposting!) Awesome! The first person to introduce vermicomposting to me was my Dad when he finished the Master Composter/Recycling Program. I’m excited to find others who do this. A lot of people seem to have an aversion to having worms in their houses, but not those two, who were also recyclers and long time gardeners. They might have also had rain barrels – very useful this summer! In any case, it was thrilling for me to connect with others who do these sorts of things. Of course I know a few people who compost, use rain barrels, garden, etc., but a troubling number of my friends and family don’t and speaking to some of the people today infused me with a touch of hope. Make sure to check out the picture above to get more insight into what was being said at the festival – and you can always go to TheWayWeGreen.ca to contribute to the growing discussion!